So where does the goal stop? That was what we wanted to know when, as a child, I played hockey on Newfoundland’s wind-swept frozen ponds. We used our old rubber boots as the goal posts, but the longer the game went on, the more we were guilty of moving the opposing team’s posts further apart so that we could score much more easily. It seems the legal academics and advocates are playing the same game with Trinity Western University (TWU). After a gruelling period of legal wrangling that involved multiple court hearings in British Columbia, Ontario, and Nova Scotia and that culminated at the Supreme Court of Canada (SCC), TWU has been forced to remove the mandatory requirement that students sign its Community Covenant in order to avoid the legal harassment of professional accrediting bodies such as the law societies. However, if you listen to some law professors and legal advocates, that’s still not good enough – they are now wanting to move the goal posts by insisting further changes. After all, the Covenant is an anachronistic throwback to a time when religious institutions were, well, religious institutions. This is the twenty-first century, and religious “pluralism” and “diversity” now mean we must all have the same views. We are so much more tolerant than we once were – so tolerant that any difference or dissent is intolerable. The evangelical Christian community has seen first-hand what it looks like when the promise of a Charter right to religious freedom is undermined by the very profession that claims to be guardians of minority rights. Consider just how well TWU was treated by the legal system. 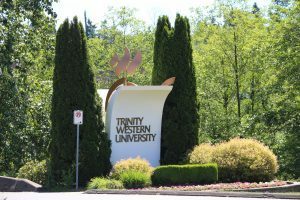 In 2001, the SCC ruled that TWU’s Charter right was denied when its education degree was not accredited because of its Covenant. Rather than recognizing the 2001 decision as a binding precedent, as is the norm, the 2018 Court barely mentioned it. That was then. This is now. TWU is a private entity and therefore should be protected by the Charter, but the SCC said that the law societies could self-define the “public interest,” so it was reasonable for them to refuse TWU accreditation because the Covenant was “degrading and disrespectful”. Notice how the Charter of Rights and Freedoms, a prior SCC decision, and exemption from human rights legislation are no longer adequate legal currency to ensure that religious freedom in this case exists in Canada. Now that TWU has removed the mandatory nature of the Covenant for students, the goal post has moved yet again. There is a call for an added dimension: remove the requirement for faculty and staff. Some are also suggesting having a law school that favours Christian applicants is a problem. It seems the concept of a private, religious school is foreign even though such universities pre-date Confederation in 1867. However, even if TWU were to follow through on these new demands it is highly unlikely that that would be sufficient to satisfy opponents – at least not until TWU is no longer a religious institution but one that mirrors all the other public universities in the country. So, what’s the point of the Charter’s protection of religious freedom? And, can we really call ourselves a multicultural, plural society if we do not allow the diversity that Christian universities bring? Indeed, the legal revolutionaries are insisting that any religious university that wishes to have a law school must pass the ultimate test: is it in sync with the prevailing views of a legal community which has come to accept the “rule of justice” rather than the “rule of law”? “Justice” in this new era is defined on a case-by-case basis as determined by the academic and the assumed popular opinions of the day. We should be under no illusions: current legal academics have the monopoly on legal education and they are loathe to allow space for a Christian university. They want it all. And so far, they have it all. TWU represents a threat to their hegemony. If ever we need a Christian law school, it is now. We have seen the extent to which the legal elites maligned the Christian community in the TWU law school case. The profession is clearly in need of more young lawyers who respect and understand religious diversity and civil debate. Should TWU, that irritating crack in the legal ice rink, file another application for their law school, we will see just how tolerant the legal community is. I hope TWU does file a new application (and, if they don’t, we need another Christian university to take up the cause). One way or another it is time that the legal profession recognizes its responsibility in allowing for the full extent of the promise of religious freedom in the Charter. That freedom can only be temporarily frustrated. I am hopeful that eventually Canada will join with the other liberal democracies that practice English Common Law, such as Australia and the United States, and allow Christians to have their law school. That will be a positive move that respects diversity and will encourage open, honest and full debate within the legal academic context as together we all participate in understanding what it means to be a free and democratic society – one that does not keep shifting the goal posts. I am a Christian so of course by and large agree with Trinity’s Christian based values. I have not thought that the ‘signing of a Covenant’ was a good idea and had hoped they would drop the Covenant of their own accord while at the same time upholding their Christian values. However I certainly do appreciate that this may be the beginning of a trend to diminish and slowly eradicate all Christian principles in private schools. Only time will tell I suppose; unfortunately it seems we are living more and more in a society which not only does not value Christian principles but rather sees them as being obsolete. This is only one of many fronts where the toleration of Christian values are being rejected. I listened to Brian Stiller on TV last night as he suggested the Christian community has been quick to wrestle with negative issues often at the expense of promoting and explaining the many positive benefits that make our Christian faith such a valuable and helpful component in todays society. We are in a serious spiritual battle that is totally winnable because Christ has declawed the enemy and we are called to let our light shine in a dark world. It is clear that unless we mount a strong, organized counter-offensive we are going to be “buried alive”! As Christian’s we are called to stand up for what we believe and not be bullied or suffer from the intolerance of the secular world that they so glibly criticize us of. We should not be surprised that we will be persecuted for our beliefs nor should we be necessarily unhappy. After all, our Example and Saviour Jesus was also persecuted and in fact allowed himself to be crucified in order that we could be saved. His words to His followers were that any time we are presenting truth we could expect the same. As was in Jesus’ day, God’s truth which TWU espouses is not popular but as Christians we know Christ’s teachings are the answer for a dying world. Are we willing to stand up and carry the torch for Jesus or are we just going to shrink back and deny those around us of receiving the joy of the Good News of Jesus Christ. Thanks Barry for leading the fight in this arena!